Whoever said “Life’s good but not fair at all” knew what he was saying. 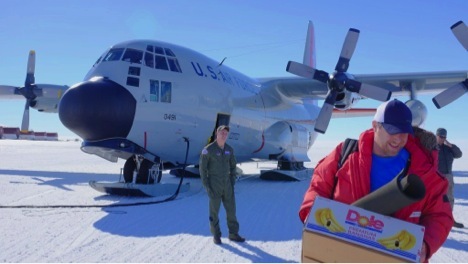 Here’s the perfect example: all of us stuck at McMurdo were on a backup mission to two primary missions flying this morning. One of them got cancelled due to weather early in the morning which made us really optimistic about flying out today. So we hunkered down and waited patiently… ok, slightly impatiently, but only because we had never got such a clear chance in the last 2 weeks. When MacOps finally contacted us we were told we shouldn’t get our hopes high but they were going to transport us to the runway and we were to wait there for more news. It didn’t look good but we were just excited to get out of McMurdo and go someplace new. We were totally ready for them to send us back home from the terminal. When they finally said we were going to fly it seemed very surreal. So, Jim, Morgan, Alex, and I got on the Herc, it took off, and without much ado, it was 1.5 hours into the journey. When it felt like we were about to land, I allowed myself a broad grin – this was really happening, we could be at Miller Range by the end of the day…. Nope – stupid, stupid me! The loadmaster sitting next to me tapped me on my shoulder in answer to my grin (that I swear, no one was supposed to see) and signaled that we were turning back. It took the four of us a few minutes to realize he wasn’t kidding us. We looked out the tiny windows and there was a complete white-out over CTAM. 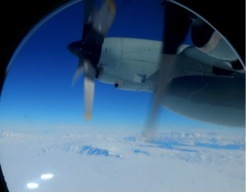 They could not risk landing in such conditions and the plane had to turn back. I wanted to ask them if they were willing to let us parachute out… how could we go back now, we were right above CTAM!? The last 2 hours felt like a cruel joke. Not fair, right? I thought we had done our time. 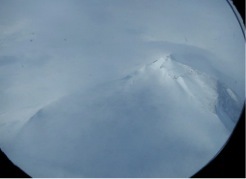 Within 5 hours we were back in sunny McMurdo. Oh well, we’ll try again tomorrow… we are one of 3 backup flights, so it doesn’t look too good but you never know! This is what it looked like halfway through the journey… how could this glorious weather not follow us to CTAM? 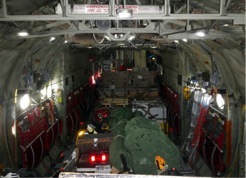 Our cargo blew my mind when I saw it all palletized on the plane. This is what the 4 of us need to survive in the field. I now appreciate how complicated the logistics of these flights might be.. 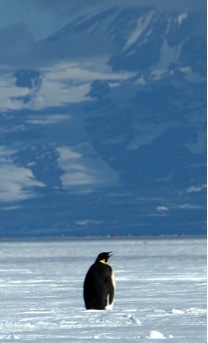 Finally, the highlight of our day… a lone emperor penguin by the roadside, on the way to Pegasus runway.